It has been a busy few weeks here in Ottawa and across the country. People everywhere are talking about devastating changes to environmental law and regulation (Canadian Environmental Assessment Act and Fisheries Act) undemocratically crammed into the federal budget. 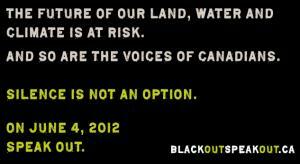 Since I first told you about #BlackOutSpeakOut, the campaign launched by Sierra Club Canada, CPAWS, David Suzuki Foundation, Ecojustice, Equiterre, Environmental Defense, Greenpeace, Nature Canada, Pembina, West Coast Environmental Law and WWF Canada, numerous other organizations and over 10,000 individuals have signed-up to join our June 4th action. On that day we will be asking you to take part in a massive email campaign (but more on that next week). In the meantime, we have organized a #BlackOutSpeakOut teach-in. On Wednesday, May 30th at 7:00 p.m. MPs Megan Leslie (NDP), Kirsty Duncan (Liberal) and Elizabeth May (Green), and environmental law expert Stephen Hazell, will field questions from a live audience at St. Paul University in Ottawa (223 Main Street). Environment Minister Peter Kent has been invited and we hope he will attend (we will save a seat for him). This is an excellent opportunity to learn about our efforts to split the environmental sections from the federal budget bill (so they can be properly examined) and force the Harper government to retreat from its war on the environment and rethink its backward moves. To attend the teach-in PLEASE REGISTER RIGHT AWAY as seating is limited! If you can’t attend but would like to make a contribution to the #BlackOutSpeakOut campaign click here. As you may know, part of the Harper government’s plan is destroying our ability to raise money to support our campaigns. That’s why they also crammed devastating changes to the Charity Act into the budget. We need you now more than ever before. Please consider making a donation today. Hoping to see you in Ottawa on May 30th. P.S. – You can Donate $10 to help defend and protect Canada's environmental protection laws by simply Texting SIERRA to 45678. To donate $20 do it twice! To donate $30, do it 3 times. It's easy!